Thank you to everyone who participated in our most recent book swap! The swapping is complete and your new books are en route. We had six participants this time, from four different countries. Here's a quick preview of the books; more detail will be posted about each book in days ahead. The next swap is being planned for the end of August and it will be a theme swap, and the theme is Flag Books! (So not really a theme, more like, all the books have to use the flag book structure.) All BEST members are welcome to participate. Check the swap guidelines for more information about how it works. hi! 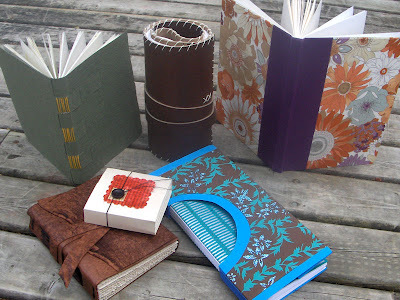 We are an "Etsy Street Team" - and there is just one requirement for membership, and that is to be and active Etsy seller, selling handmade books. I would like to become a member of this group, I am a new Etsy seller and I make handmade books...so what now? Another lovely set of books! Can't wait to get my package in the mail!